Main Street to Your Street we’re your hometown electrician. Elevating your home? A cost effective residential elevator can help. Call us. Dedicated to providing outstanding customer service, we develop lasting working relationships with our clients, many of whom go on to become repeat customers – testament to the consistent quality of all our electrical installations. This allows us to understand fully all our clients’ individual requirements and ensure that the service we provide is of the very highest standard. All our electricians are fully qualified, highly skilled and have many years’ experience in residential and commercial installations, testing and ongoing maintenance. Throughout all our projects, large or small, we remain focused on combining safety with efficiency to offer you a high quality service at a competitive price. Although we consider projects of all sizes – from a single socket to rewiring an entire home – a lot of the projects we undertake are commercial. We understand the pressures and restrictions of working within a commercial environment and make every effort to ensure that our work does not interfere with the running of your business. For home owners we also do our best to accommodate your work schedule, respect your home and clean up any mess the job may by necessity create. Call us. We are based in Toms River and service all of Ocean County and beyond. Aging sensors lose there ability to properly sense smoke - and that include hard wired detectors also. Yes, we replace Smoke Detectors. It might appear a small job for an electrician but perhaps one of the most important. Call us. 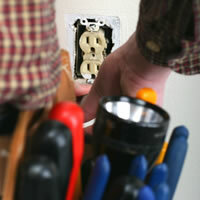 Electric Service Hookups - New Wiring - Rebuilds - Data, Communicationsand Entertainment wiring - Sockets, Plugs & Switches - Service Upgrades - Safety Audits - Backup Generators - Solar hookups - Whole House Surge & Lightning Protection - Ground Fault Protectors - Outdoor Wiring & Lighting - Pools, patios and porches, workshops. Fans & Lighting - Fire & Smoke Alarms etc etc etc. If electricity runs through it - call us!